Today we had to cross Albermarle Sound. This is another shallow (10-15 feet) body of water that is feared by all boaters. By leaving early we crossed the 14 miles of open water without difficulty and arrived in Elizabeth City around 10:00AM. The docks there were not great although the price was right (free). So after a short tour of the town we left for the Great Dismal Swamp Canal. 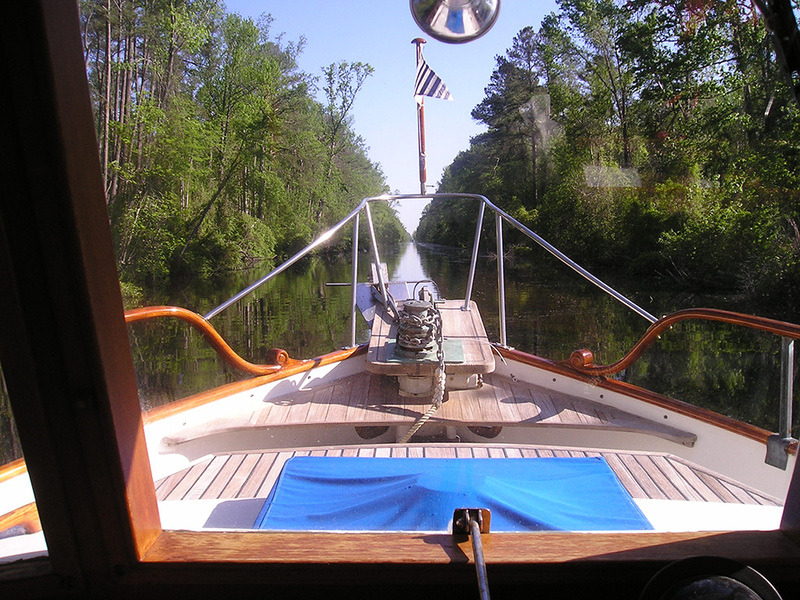 Developed by George Washington in 1793 it is the oldest continually used canal in the USA. It is very narrow (see photo) but there are no commercial tows. There are two locks that only open 4 times a day. We went through the first lock and got to the NC Visitors Center which has the canal on one side and highway 17 on the other side. The docks are very good and we are moored with a C-Dory and a large sailboat.